On Thanksgiving, for the last several years, my family of 5 and my mother join my sister’s family at their house that’s a short 45 minute drive away. The focus of the day is for the 5 young cousins to be together and hopefully for the adults to not work too hard. Each adult typically has a job of making one or two food items for the Thanksgiving meal. My sister makes corn pudding and a green vegetable, like roasted brussel sprouts. My brother-in-law often makes an amazing apple and sausage stuffing and a new and different dessert each year. My mother makes a cranberry orange salad and brings rolls that are often the hit of the grandchildren. My husband makes the turkey and has perfected the process using Alton Brown’s recipe for brining a turkey. (One year, my husband decided to make a beef tenderloin rather than a turkey and we are still hearing about this travesty from the 12 and under crowd.) I make the pumpkin pies. I wouldn’t say the adults in our family are particularly fans of tradition, but this division of labor seems to work for us. The meal choices were mostly driven by what the individual members think must be present at the Thanksgiving meal. My husband is the one that says there must be pumpkin pie every year. Growing up, my grandmother and mother were the pie makers. They were applauded for making their own crust that I always thought was beautiful, flakey and the best part of the pie. 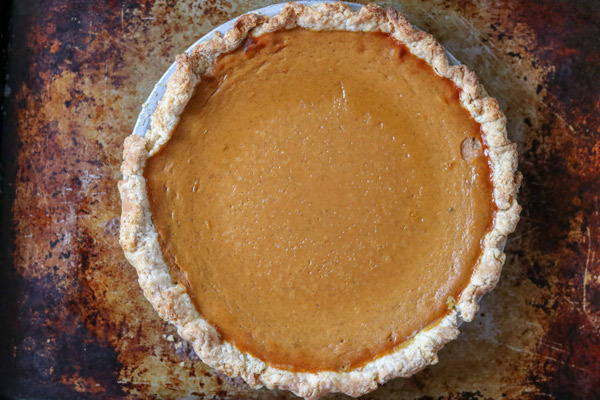 As an adult, I wanted to learn to make homemade pie crust, as it seemed like an important skill to have in my family and, honestly, I was quite impressed by the accolades they received. 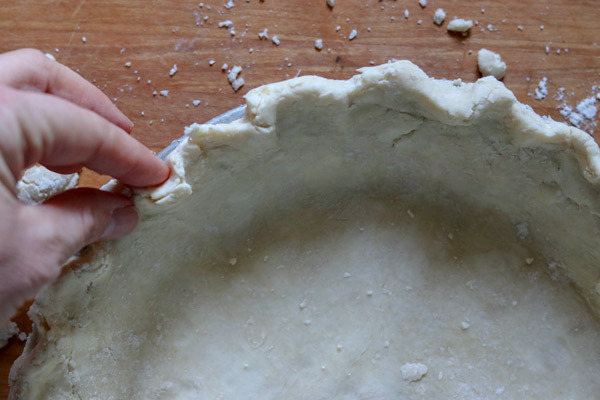 When I was young, my grandmother and mother made pie crust using shortening. In the last 10 years, I have started to make it with butter (which is more traditional) and I use Mark Bittman’s recipe from my favorite cookbook How to Cook Everything. He suggests mixing the butter and flour in the food processor, which makes it amazingly quick and easy. 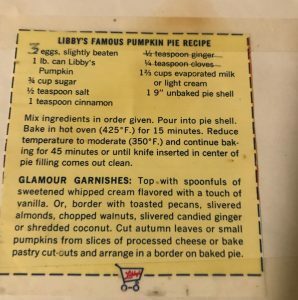 The pumpkin pie recipe I make was adapted from the Libby’s Pumpkin can label many, many years ago by my grandmother. 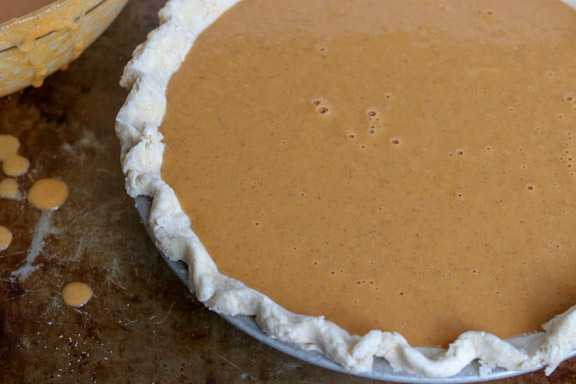 The pie is more of a pumpkin custard than typical pumpkin pies, with an additional egg added to the recipe. Elizabeth made this pie and took these beautiful pictures. I promise it’s not as hard as people make it out to be. And boy is it yummy! It’s also okay to buy a pre-made pie crust and skip down to the pie filling recipe. Remember, this is the only item I make for Thanksgiving. So, I have the time to make the crust. You may not have the time or the desire to and it’s great to let someone else do the prep work. Place for flour, sugar and salt in the food processor and pulse 2-3 times. Remove the mixture and put in a medium mixing bowl. Add the ice water, a little at a time, and begin to bring the mixture together with a wooden spoon, spatula or your hands. If the mixture seems dry and crumbly, add more water. I always seem to need to add a little more water. 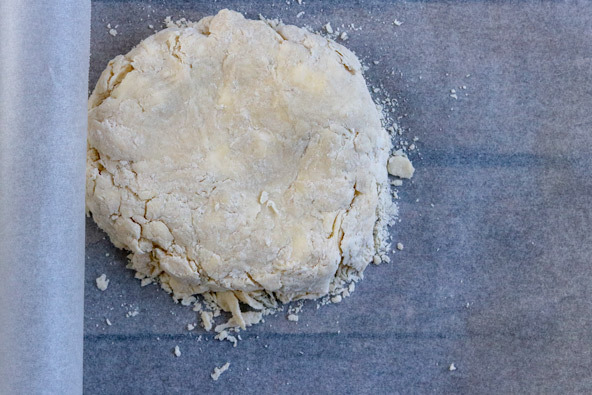 Form the dough into a disk and place in a sheet of parchment paper. Put in the freezer for 30 minutes. 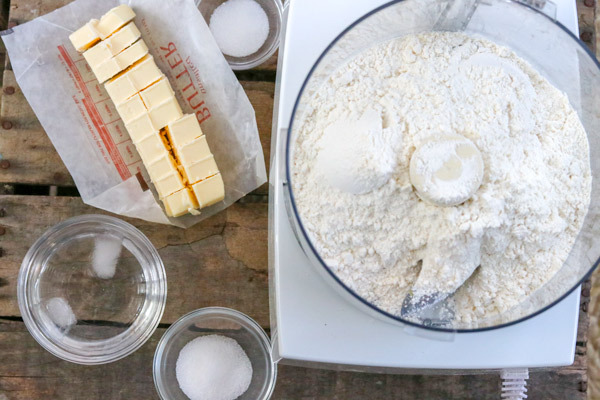 Remove the dough from the freezer. Sprinkle some flour on the parchment paper that you just removed from the dough. Then, sprinkle more flour on the disk of dough. Roll out the dough on the parchment paper turning the parchment paper a half turn every few times you roll out the dough. Roll the dough until it is about 1/4 inch thick, a little larger than the pie plate. Place the pie plate upside down on the rolled out dough and turn over the parchment paper/dough/pie plate all at once. 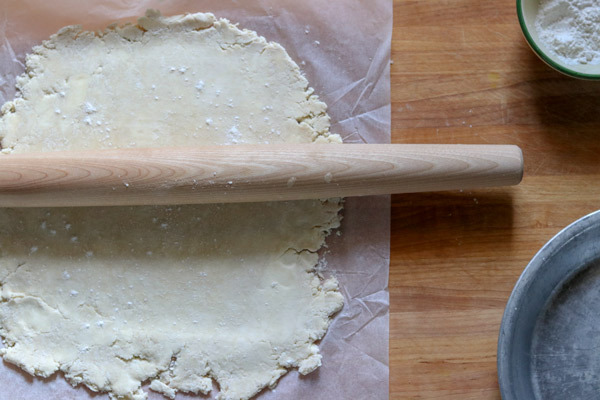 This will place your pie dough right into your pie plate. Remove the parchment paper. Tuck the edges under and decorate the edges, or not, with your finger or a fork. Place the pie crust in the freezer for at least 30 minutes. Remove from the freezer and add the pie filling. No need to pre-bake the crust this time. 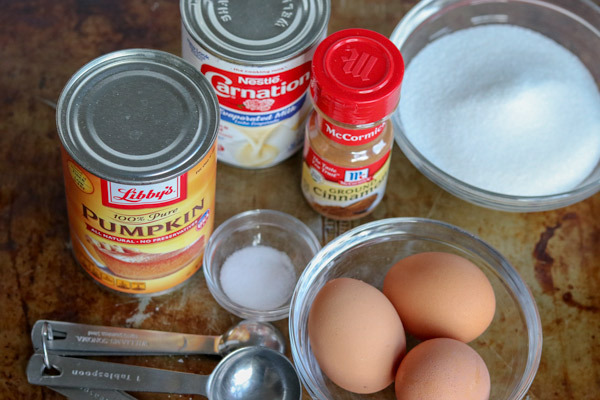 Add all of the ingredients to a mixing bowl in the order listed on the recipe. Mix until combined. Pour into the pie crust. Bake at 425° for 15 minutes. Reduce temperature to 350° and cook for another 45 minutes or until knife inserted into pie comes out clean. If the crust is getting too brown, you can cover with aluminum foil or pie making ring. Cool on a cooling rack. I serve the pie with freshly whipped cream (made in my stand mixer) with a little powdered sugar added to it. I always make 2 pies so that there are leftovers. The best part of Thanksgiving for me, is enjoying a piece of pumpkin pie with a cup of coffee for breakfast on the morning after Thanksgiving. Elizabeth will be posting her family’s pumpkin recipe in the next day or so. And later in the week, we’ll be posting about very important self care during this upcoming holiday weekend. Stay tuned. 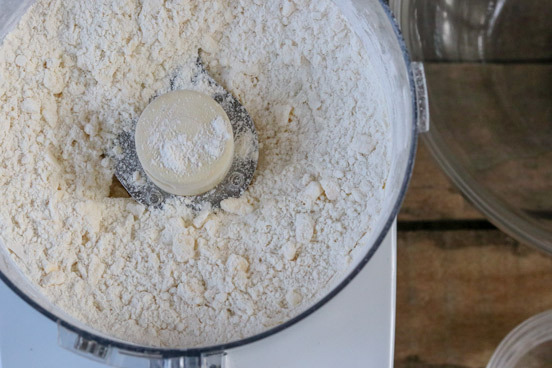 Place the flour, sugar and salt into the bowl of a food processor and pulse 2 or 3 times to combine the ingredients. Add the butter and pulse about 10 times or until the mixture looks like coarse cornmeal. Remove the mixture from the food processor and place in a medium mixing bowl. Drizzle the ice water over the flour-butter mixture. 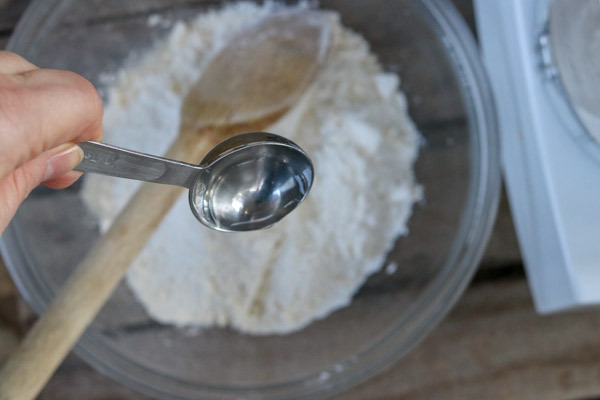 Bring the mixture together using a wooden spoon or spatula. You can also use your hands. If the mixture seems too dry, add more water starting with another 1/2 tablespoon. Form the dough into a disk and wrap it in parchment paper. Place in the freezer for 30 minutes. Remove the dough from the freezer. Sprinkle some flour on piece of parchment paper you just unwrapped from around the dough. Then sprinkle some flour on the disk of dough. Roll the dough by turning the parchment a half turn after rolling a few times. Roll out the dough to about 1/4 inch thickness and 10 inches in diameter ( a littler bigger than the pie plate). Place the pie plate upside down on the dough. Pick up the parchment/dough/pie plate and turn it all over at once. This will place the pie dough right into your pie plate. Remove the parchment. Gently press the dough into the pie plate. Fold any extra dough under to make the dough even with the outside edge of the pie plate. Then decorate (or not) by pressing with a fork or your fingers. 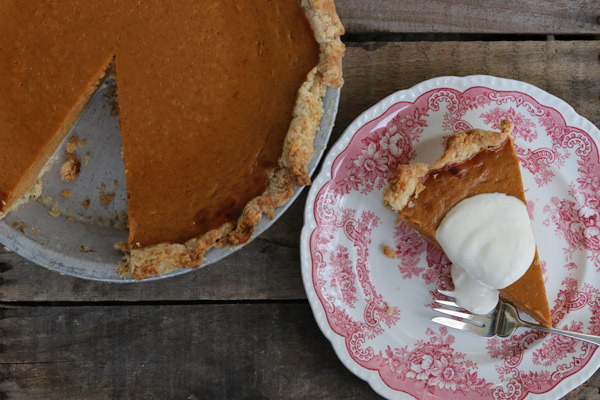 Place the pie plate in the freezer for at least 30 minutes. 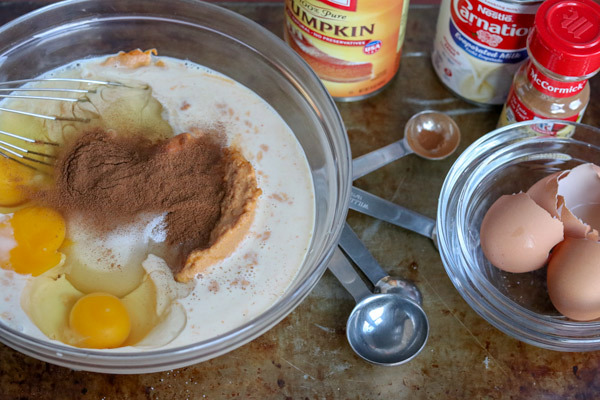 Remove from the freezer and add the pumpkin pie filling. No need to pre-bake the crust this time. If the crust starts to brown too much around the edges, you can cover the edges with pieces of aluminum foil or little pie crust covers you can buy. Bake in oven at 425 degrees F for 15 minutes. Reduce heat to 350 degrees F and cook for 45 more minutes or until knife inserted into pie comes out clean. If crust is getting too brown, cover crust rim with aluminum pie ring or aluminum foil.